In “The European trust crisis and the rise of populism” (PDF), Yann Algan of Sciences Po, Sergei Guriev of EBRD and Sciences Po, Elias Papaioannou of the London Business School, and Evgenia Passari of Université Paris Dauphine study evolution of unemployment, attitudes and voting 2000 to 2017 in more than 200 subnational regions throughout 26 European countries. The authors show that increases in unemployment post-financial crisis are strongly correlated to increases in support for populist and anti-establishment political parties. The authors also find a statistically and economically significant relationship between regional unemployment and a decline in trust towards the European and national political institutions—though there is a small or non-existent effect on trust in other people, police or church. The European Union’s (EU) unemployment rate increased from 7 percent in 2007 to 11 percent in 2013. Even in 2017—a decade after the start of the crisis—unemployment remains quite high and above the pre-crisis level at 8 percent. Unemployment dynamics have been highly uneven, however, varying widely both between and within countries. In Germany, unemployment has actually declined in recent years after a short-lived spike in 2008-2009. In Greece and Spain, it climbed above 20 percent, and in some regions it exceeded 30 percent. In Italy, the unemployment rate in the North was close to EU average, while in some Southern regions it rose above 20 percent. The analysis shows that the regions that have experienced a greater increase in unemployment after the crisis are the ones where populist politicians have gained more votes. 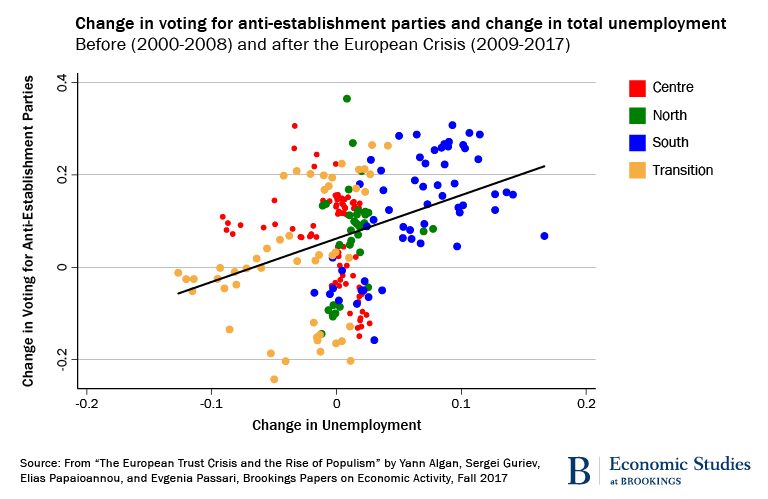 The link between the change in unemployment and support for the anti-establishment is strongest in the South of Europe, followed by Eastern and Northern Europe. The link is largely absent in Europe’s “Centre” (Austria, Belgium, France, Germany, the Netherlands and Switzerland). The authors did not receive financial support from any firm or person for this paper or from any firm or person with a financial or political interest in this paper. They are currently not officers, directors, or board members of any organization with an interest in this paper. No outside party had the right to review this paper prior to circulation.